In 2015, I went on a life-changing journey to Togo, West Africa, with a small group of influencers. We visited the multiple compounds of hair and skincare brand Alaffia to learn about the concept of fair trade, how ethically sourced ingredients are actually retrieved, and how the brand works toward improving the lives of Togolese people on a daily basis. Olowo-n’djo Tchala, one of Alaffia’s owners, graciously opened up his homes—yes, homes—to us and immersed us in Togolese culture. His staff was warm, and everyone we met was so excited to see us—or, maybe they were really excited to see Olowo-n’djo, and by extension, his guests. We received a royal welcome everywhere we went, with people singing and rolling out red carpets for us. Okay, they weren’t actual red carpets, but we were followed around by bands and processionals at times, and people sang welcome songs as Olowo-n’djo shook hands, dished out hugs and engaged in a two-step or two with excited people who hadn’t seen him in a while. We even had a meeting with some diplomats at the Togo-based US Embassy who gushed over Olowo-n’djo and wanted to make sure we knew how important his work and message were so we could take our conversation and observations back to the United States and spread the word. Enter Tabi Bonney. Diplomats from that same US Embassy introduced Bonney to Olowo-n’djo, and a beautiful relationship was born. That relationship was one of several factors that inspired the birth of Itadi Body. But let’s backtrack for a sec: Tabi Bonney is a man of many talents, and many of you may already be familiar with his name and music, but in case you’re not, the short of it is: He’s a Togo-born, DC-raised, LA-based rapper. Bonney has worked with Wale, Wiz Khalifa, and Raheem DeVaughn, just to name a few. 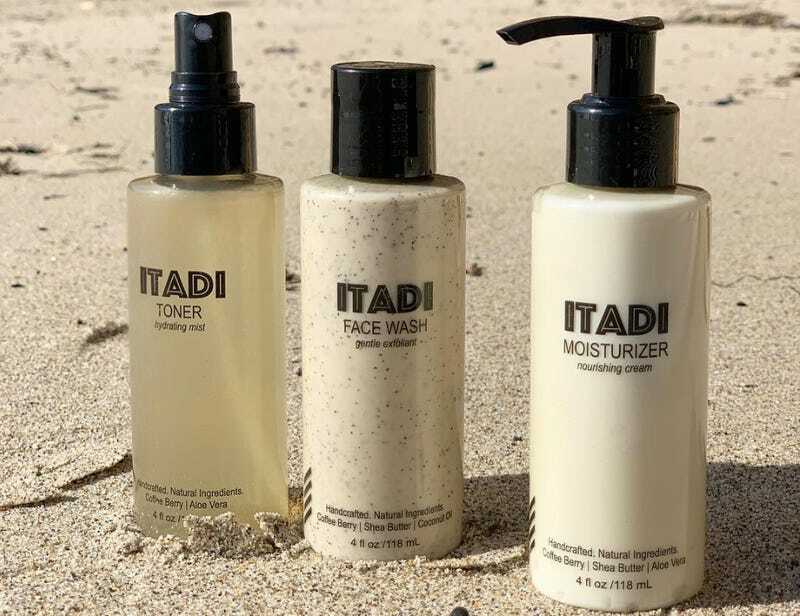 However, his most recent collaboration is ITADI Body, a unisex skincare line formulated with coffee berries (and other nourishing ingredients) harvested from one of the Bonney family’s farms in Togo. At the moment, the collection includes a face wash, toner and moisturizer, geared toward all skin types. The brand gets its name from Itadi Bonney, Tabi’s late father, who urged his children to keep the family farms going before he passed, so here we are. I recently caught up with Bonney and his sister, Zelle, to discuss their family venture, inspiration from Olowo-n’djo Tchala, how you can step your skincare game up with their products, and the impact their business will have on Togolese lives. The Glow Up: Tell me about Itadi Body and what your vision is for the brand. Tabi Bonney: It started from just going back and forth to Togo, where I was born—my father is from there, my mother is from Washington, DC—linking with the US Embassy and them introducing us Olowo-n’djo Tchala, who is of course, as you know, the owner of Alaffia. We’ve had this land for so long, our father had been telling us, “Please, figure out something to do with the coffee farms, with the cacao farms.” I had no idea that it was possible until meeting Olowo-n’djo, who then was like, “We need to build up the country as a whole. Here you go. I would love to give you a skincare line for you to develop yourself.” That’s how Itadi Body was essentially made. We just felt that it was paying homage because [our father] unfortunately passed five years ago now. We just felt it was always his vision just to uplift the country, to uplift Africa. He believed in the beauty of the continent, so I couldn’t think of a more appropriate name than using his. We just need legacy to live on as black people as a whole. TGU: How did you meet Olowo-n’djo? TB: Weirdly enough, the US Embassy in Togo reached out to me on my birthday. I had just put out a video with me and Wiz Khalifa. The PR person from the US Embassy shot me a message on Facebook, saying, “Hey, I’ve been a fan forever. Just finding out you’re from Togo. Do you ever come back to Togo? We would love to bring you back to perform.” I then replied saying, “Yes. I do music. I do come back home all the time. That’s cool and all, but we have this land that we’re trying to figure out how to cultivate or what to do to get stuff back to the US.” Then, they put me in touch with Olowo-n’djo. That’s how it happened. TGU: Watching Olowo-n’djo in action was fascinating. I don’t know. For lack of a better comparison, he was like Shaft in Africa. I don’t know if that makes sense, but just to see what a folk hero he was, or he is, I should say, it was cool. TB: I feel like he’s living history. You know how when you look back and you see leaders that have changed a country or changed the world? I feel like he is one of those people. I’m just honored to know him, be in his presence, and be able to work with him. TGU: One of the takeaways I had from some conversations with him was that he felt like there was an issue with ownership in Togo. Meaning, big brands will come, and they’ll take advantage of certain resources like Shea butter, and other things, but it doesn’t necessarily trickle down to the people. Do you have any thoughts about that? TB: Yes. That’s our main mission. We’ve noticed that. My father was always a proponent for owning what you have. Our main mission is we’ve noticed that a lot of the younger generations leave the village and head to the city for work. Essentially, they then leave the farms and they don’t know the value that it actually has because these middle men, outsiders have been coming in, and taking from Africa or giving people what they feel it’s worth. With us, our main thing is ownership. That’s why we created our own brand as opposed to selling it to somebody else for them to then brand it as their own. That’s why we’re doing it with this skincare, with the coffee, and other things that we’ll be producing in the future as well. With that being said, we’re hoping to be a model in our region of Togo, give people the proper money, also show them that they can create their own as well, and not to leave this land. TGU: Tell me about the products you have available. TB: We have face wash, toner, and face moisturizer right now. We’ll be rolling out the body wash in about a month. Our main ingredient is coffee berry, which is the fruit of the coffee plant. It’s the outside part. You know on the inside you get coffee, which everybody drinks. We took the fruit of coffee, which is super high in antioxidants. A lot of beauty companies, if they do have that, they charge an exorbitant amount because it’s a hard thing to get and preserve to put into products. That’s our main thing is coffee berry in everything. Also, the coffee bean itself is in our face wash for exfoliating the skin. TGU: Zelle, talk about your involvement with the family business. Zelle Bonney: Tabi and my mom are primarily taking the lead in terms of figuring out all the shipping ... All the cost associated with getting all the raw materials, the raw forest material from deep in the mountains to the US in order to get everything processed to distribute is a lot of heavy lifting. That’s where the price component comes in because we really want to do a high-quality product and we also have a very rare coffee. We discovered that it’s a Robusta and not an Arabica bean once we started learning about coffee. Arabica is basically the coffee bean that is in most coffees. Robusta is a specific kind, and it’s very rare to get one of the quality that we have that has such a higher antioxidant percentage than the Arabica bean. Even just finding out all that information, the investment Tabi’s made, having all these specialists look at everything, and make everything what it is because he wanted to have a product that not only was great inside the bottle, but you also are proud to have the bottle on your shelf and that it looks good. I think his idea in terms of presentation and visual translates from his social media platform. Also, to a product we want to present to everyone. I think we are constantly battling this idea that when you have something from Africa, it’s of less value. What we want to do is always give you the highest value. Whenever you get something even in the product that you hold, it’s like, “Oh my God. This came from Togo.” It’s just like you have that disconnect because it looks so good. Most times, when you think of anything African, it’s just like everybody’s trying to make the most of the little that they have. Thankfully, we are blessed to have different investors, also being able to invest ourselves, and just getting it to a level where when you see it, you’re actually excited about what’s coming out of Africa. You can display it on your shelf. It looks like it belongs in a boutique hotel. It’s a beautiful product. The inside of it is also fair trade, it’s ethically sourced, and it really helps farmers on the ground in Togo, in our villages. For us, it’s a magical moment. We just need to get it out. The price may be a little bit higher but, it’s because of what we’re trying to do. Everybody has to get paid, and at the same time, we have to get it to you. We want to change what you think you can get from Africa, too. TGU: Going back to quality and you saying that people don’t necessarily think about the quality of things coming out of Africa. I’m glad you said that, because on my trip, I learned that Togo is a contender for coffee, like the coffee is really good. But at the same time, exporting may be hard logistically due to limited ports of entry and language barriers. Am I correct with that? TB: You’re correct, yes ... mainly Togo’s products go to Europe, not the US. Even most Italian coffee is Togolese coffee. The world doesn’t know that. The coffee you drink in Italy is from Togo. The main exporter of coffee to Italy is Togo. We’re even the first outside of the skincare bringing it to the US. It’s logistically so hard to ship from Togo to the US just because of one, the language barrier and the US barely does any trade with Togo. It’s more so like a Ghana or Nigeria, which is English. It’s so weird that we could all be next door to each other, but that language barrier cuts you off. TGU: The last thing I wanted to talk about is the economic impact on people in Togo, the staff that you have. What is Itadi Body doing for communities there? TB: It changes lives. We’re able to employ. At this point, we’re only employing about 10-15 people. We legitimately support those families. They depend on us monthly in order just to eat or send their kids to school. Our thing is to expand that, so that within that region and throughout all of Togo, we’re able to get bigger to be able to show people that what we have in our land is worth more than you know. TGU: Awesome! Is there anything you want to add? ZB: I think we’re just excited to finally come to market. It’s been a long process of trying to get everything right for the consumer, so that the consumer is really happy with the product. The product is a unisex product. Tabi was even saying that a male friend who is addicted to Kiehl’s and only uses that on his skin [because] it took a long time for him to find a product that worked for his combination skin—he decided to take a chance and try our brand for a little bit. He loves our brand. He wasn’t able to find anything else before. Now, he’s so happy to support a black business, an African business, and find a product that really works for his skin that’s fair trade [and] ethically sourced. He was excited about that. Tabi uses it on his skin. I changed my routine. I use it on my skin now. It’s a great product. I know it takes a lot to change your routine and also try something new, especially for women. You can usually go to a drugstore and buy whatever’s on sale, which is what was my normal routine was. I think taking a chance on something new that has the ability to change people’s lives, to support different families in Togo, West Africa, and also be beneficial for your skin when women are trying to find ways to stop using so many chemicals on their bodies from the clothes and the jeans that you put on, to products that you’re putting into your hair. Everything we do and things that we consume daily have so many chemicals. To just have one thing daily that you start your day off with and that you end your night with that has no chemicals is a gift. I think it’s a gift that people can give themselves and think about. We believe, in terms of what we’ve been able to do with a product, we’ll have return customers. We’re just asking people to try it for the first time, check us out, see what it does for your skin, and how it makes you feel. Then, make a decision if you want to stay with us. Big Beauty Tuesday: How Do You Treat Yourself? Big Beauty Tuesday: Let’s Hear It for Happy Accidents! Toddler mom. Brooklynite. Beauty and pop culture obsessive. Wanderluster. Send help...and wine, lots of wine.